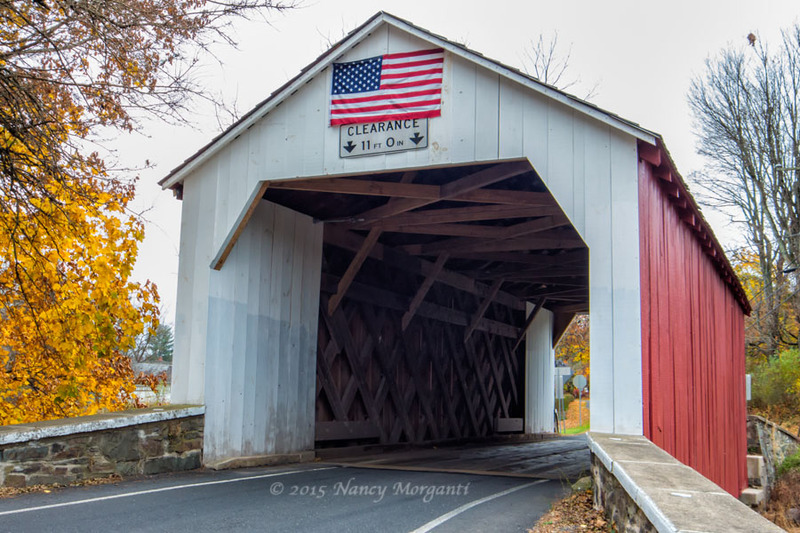 Nancy and I decided to see the twelve covered bridges of Bucks County Pennsylvania, and thought it would be nice to visit them while there was still a hint of fall color remaining. There was a heavy overcast most of the day, and while this yielded uninteresting skies, it did yield a softer light to photograph the bridges without any harsh lighting contrasts. 1. 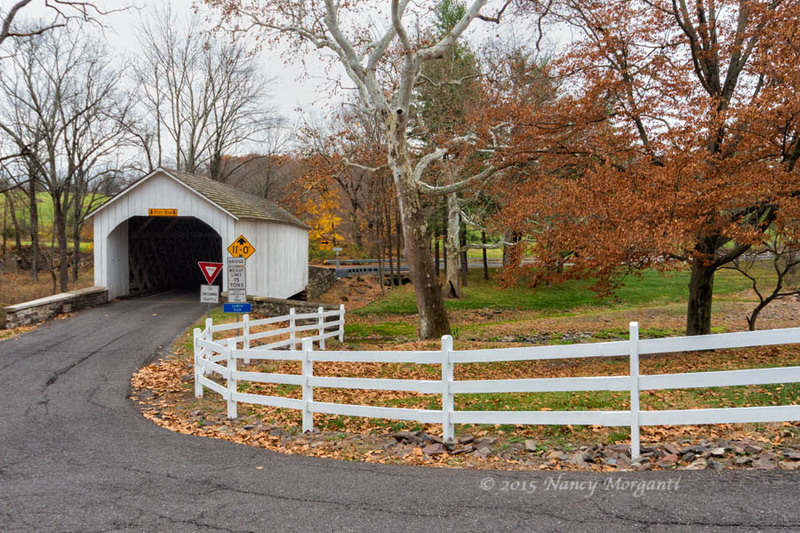 Van Sant Covered Bridge: Located in a very rural setting along Covered Bridge Road in Solebury Township, the Van Sant Covered Bridge was built in 1870 and crosses the Pidcock Creek. 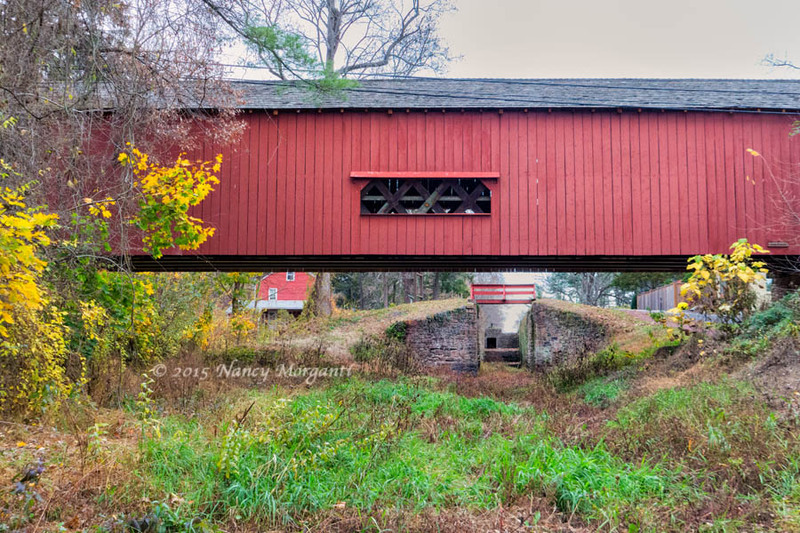 A hallmark of many Bucks County bridges it is red with white entry portals. Height Limit: 10 ft 3 in; Width: 15 ft; Weight Limit: 7 tons; and has one span at a Length of 86 ft.
2. 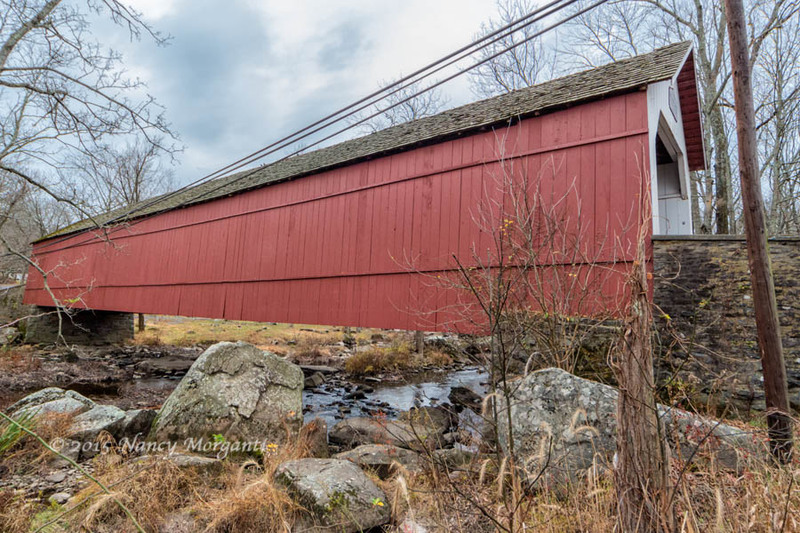 Loux Covered Bridge: Located on Wismer Road in Plumstead Township near Hinkletown, the Loux Covered Bridge was constructed of Hemlock in 1874. Both the Cabin Run Covered Bridge and the Loux Covered Bridge cross Cabin Run Creek. Known as a dangerous place to ford, the drowning of Reed Myers, a popular young man led to its construction. This is second shortest bridge in the county, and the only one painted white! Height Limit: 11 ft; Width: 15 ft; Weight Limit: 15 tons; Length: 60 ft.
3. 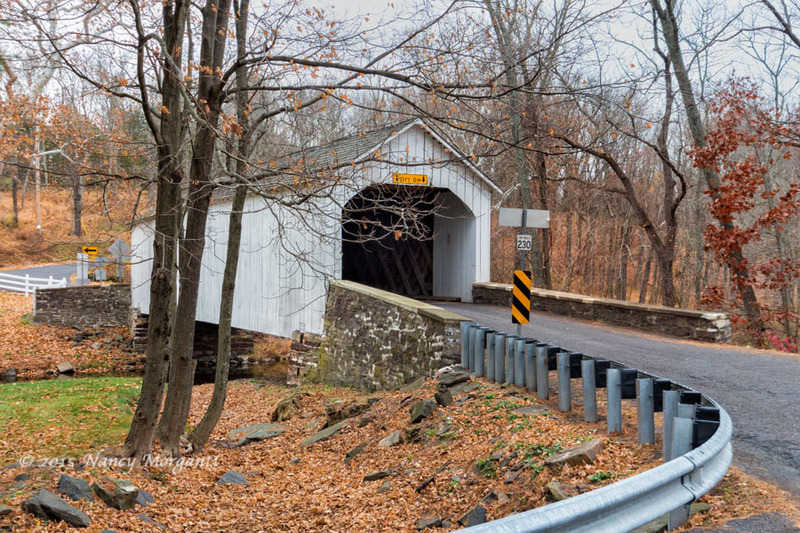 Cabin Run Covered Bridge: Located on Covered Bridge Road in Plumstead Township, the Cabin Run Covered Bridge was built in 1871 and crosses Cabin Run Creek. The creek, so named for its early concentration of log cabins and small stone houses constructed along its course, empties into Tohickon Creek. Height Limit: 9 ft 9 in; Width: 15 ft; Weight Limit: 3 tons; Length: 82 ft.
4. 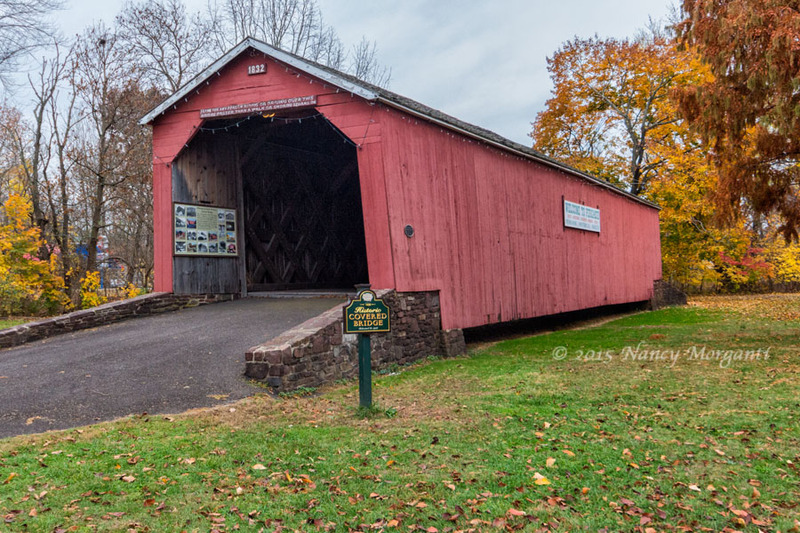 Frankenfield Covered Bridge: Built in 1872, the Frankenfield Covered Bridge crosses Tinicum Creek only two miles upstream from where the creek flows into the Delaware River. 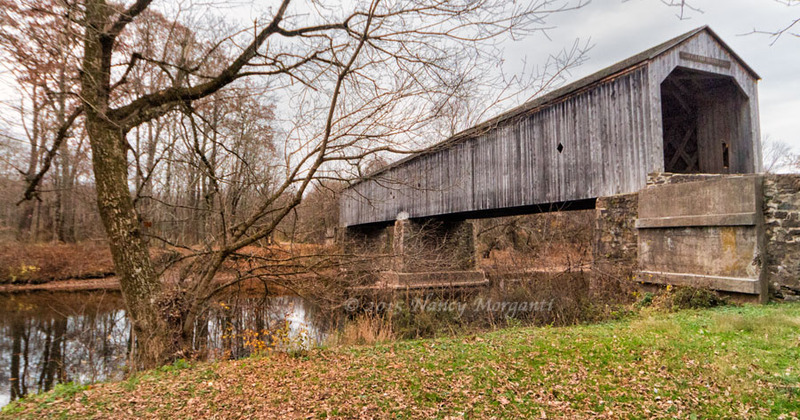 This bridge is one of the longest covered bridges in the county. Stories are told that leeches were collected here in Colonial times and sold to Philadelphia doctors for blood-letting. Height limit: 9 ft 5 in. ; Width limit: 12 ft.; Weight limit: Check local postings; Length: 130 ft.
5. 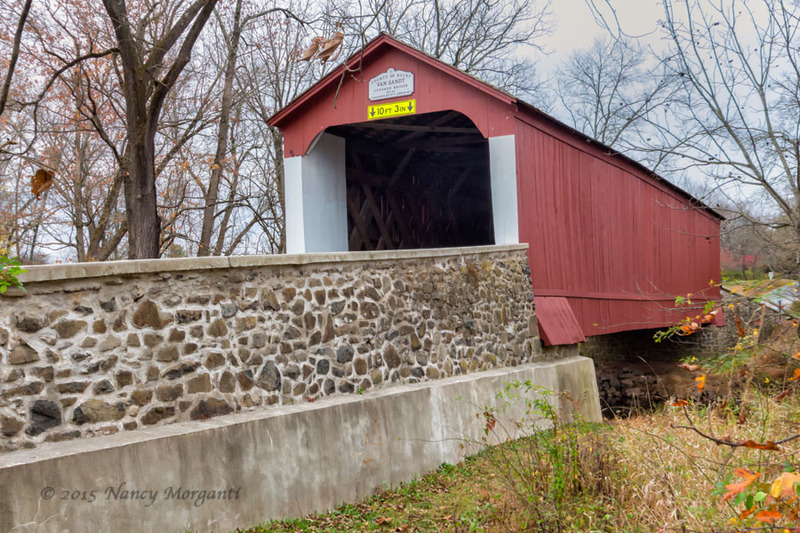 Erwinna Covered Bridge: Located on Giegel Hill Road in Tinicum Township, Erwinna Bridge was built in 1832 and crosses the Lodi Creek. The shortest bridge in Bucks County is noted for its lattice-type construction. Erwinna stands as part of a tract of 528 acres purchased by Colonel Arthur Erwin in 1769. Height Limit: 11 ft; Width: 15 ft; Weight Limit: 29 tons; Length: 56 ft.
6. 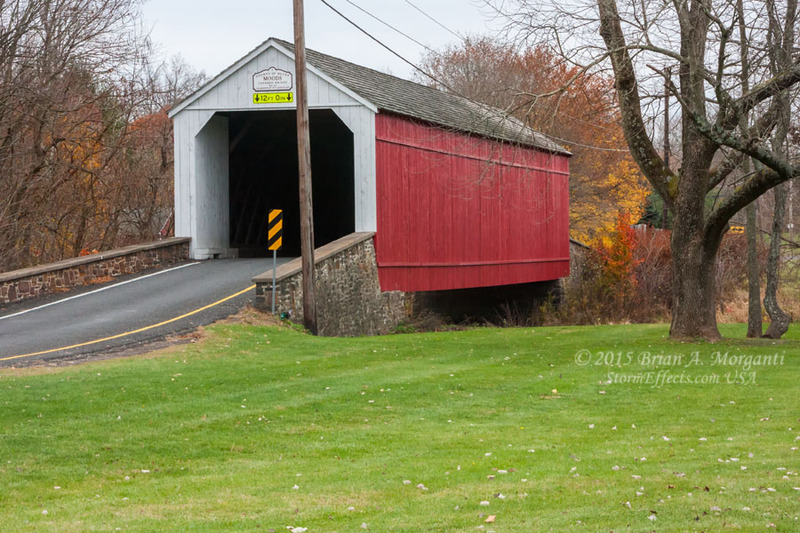 Uhlerstown Covered Bridge: The bridge is located on Township Route 441 west of Uhlerstown, Pa. The bridge was erected in 1832 and the builder is unknown, the construction is with the Town Truss design and has 1 span. 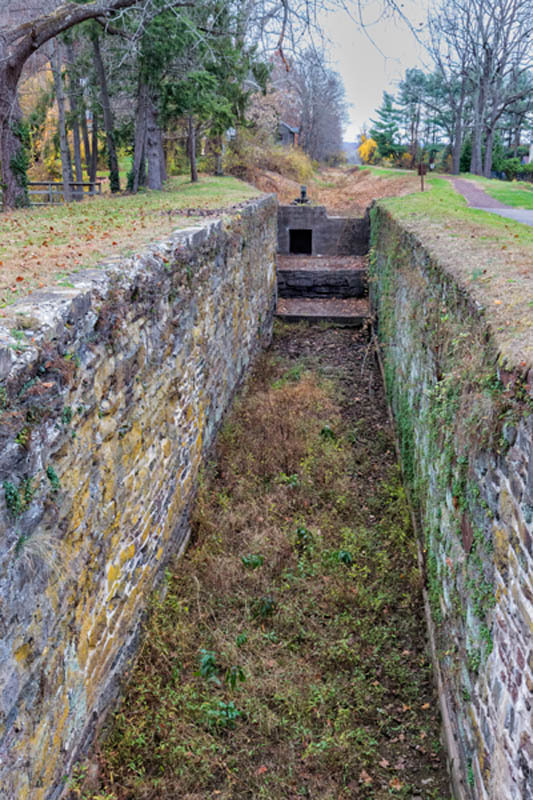 The structure is 110 feet and 15 feet wide and crosses the Tinicum Creek and actually crosses the Delaware Canal at Lock 8 shown above. 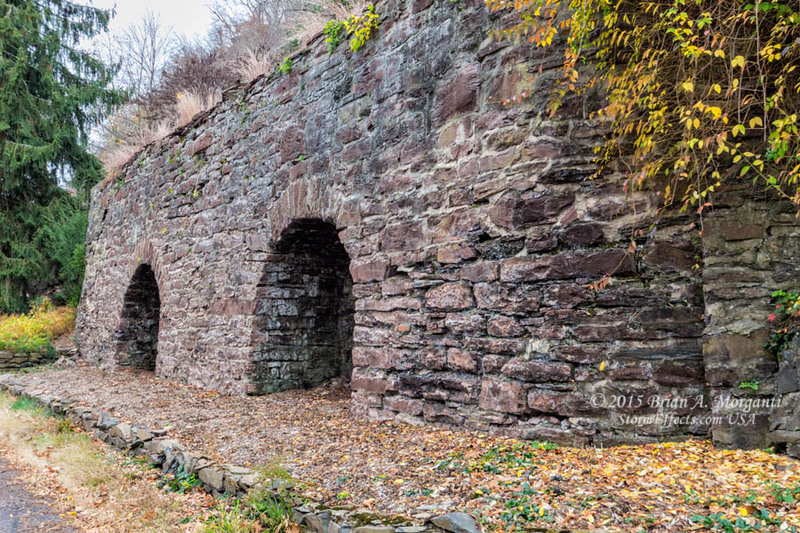 A limekiln is also located at this same location. The bridge is in good condition and opened to vehicle traffic, it is owned and maintained by the State of Pennsylvania. 7. 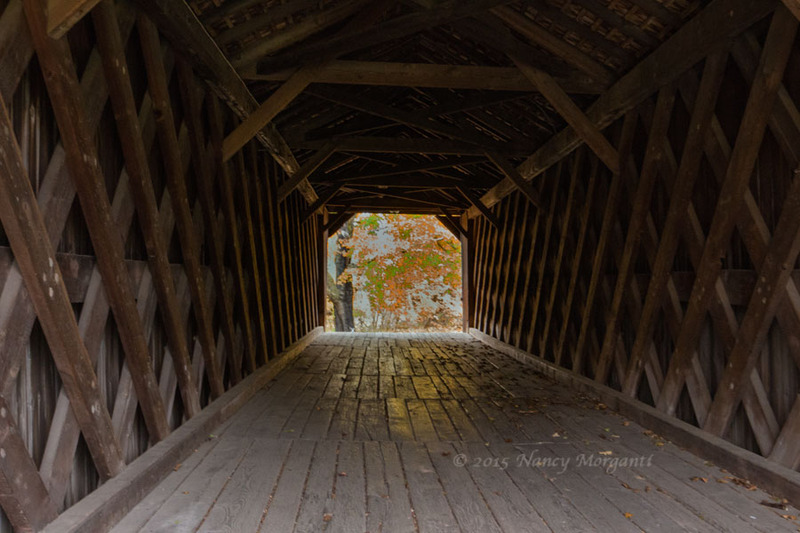 Knecht's Covered Bridge: Was built of hemlock in 1873 and uses the Town Truss design with one span. 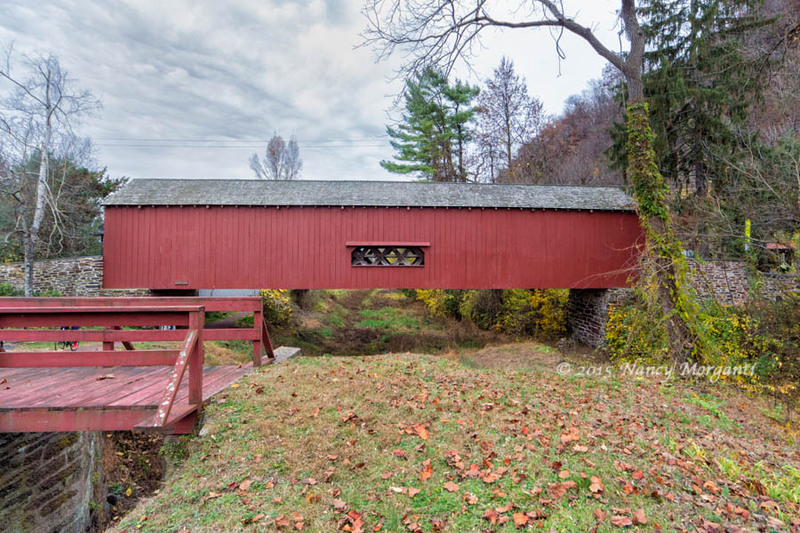 The 110' by 15' bridge is painted in the traditional red with white portals. 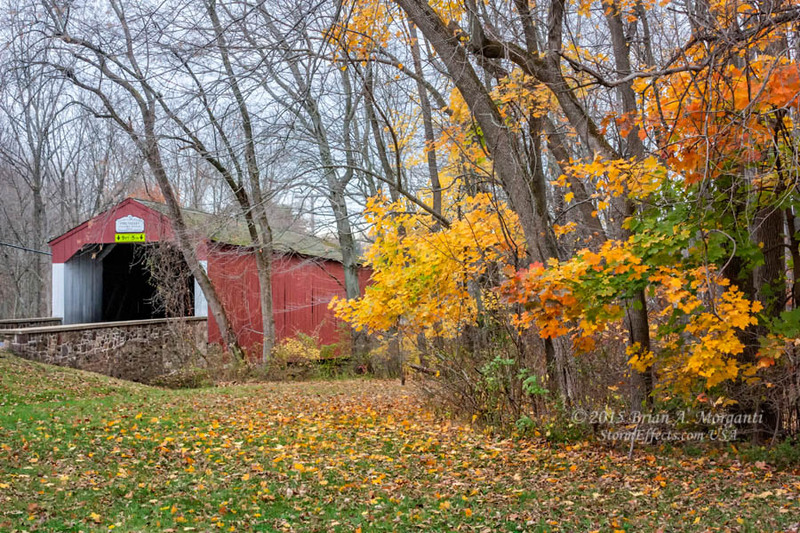 This bucolic area is dotted with stone Bucks County farm houses. 8. Sheard's Covered Bridge: On Covered Bridge Road between East Rockhill and Haycock Townships. 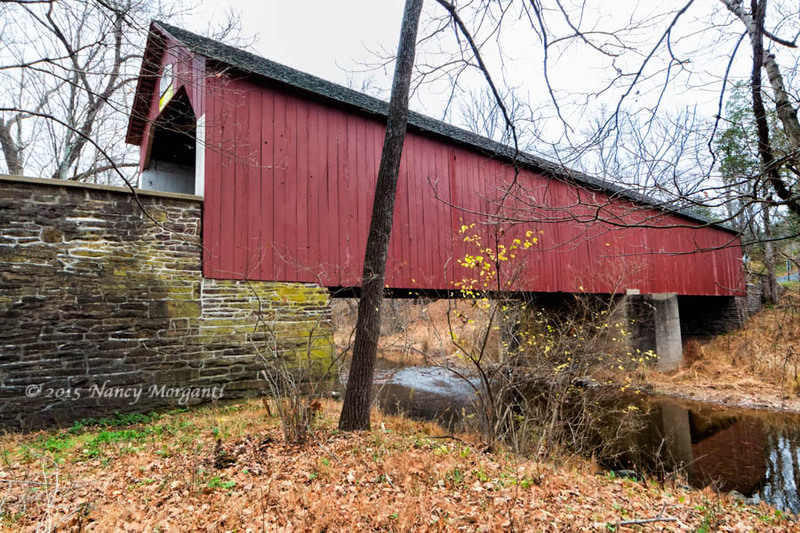 Built in 1873, this bridge spans the Tohickon Creek and is one of Bucks County's longer bridges. Height Limit: 12 ft 1 in; Width: 15 ft; Weight Limit: See local postings; Length: 130 ft.
9. 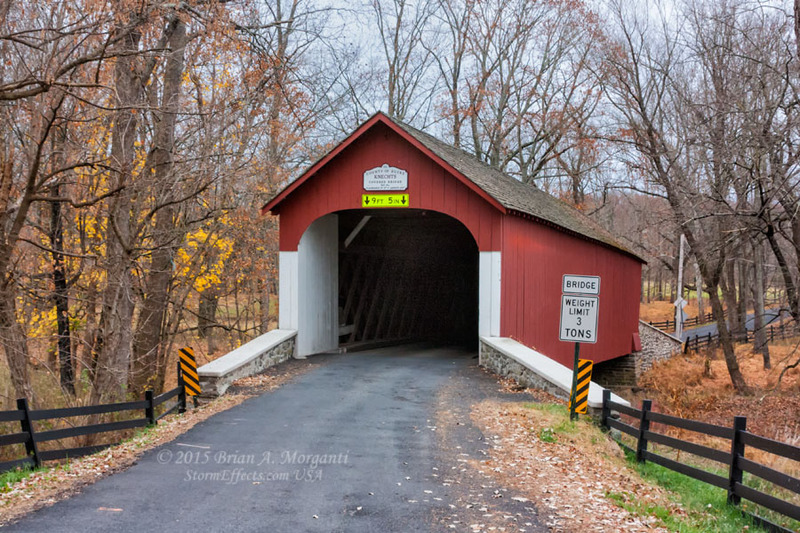 Mood's Covered Bridge: Built in 1874 and one of two covered bridges in Perkasie, Mood’s Covered Bridge crosses one of the principal watersheds in the northwest portion of Bucks County, the Perkiomen Creek. The bridge was destroyed by arson June 22, 2004, and removed from the National Register of Historic Places. The bridge was rebuilt and reopened to the public in 2007. 10. 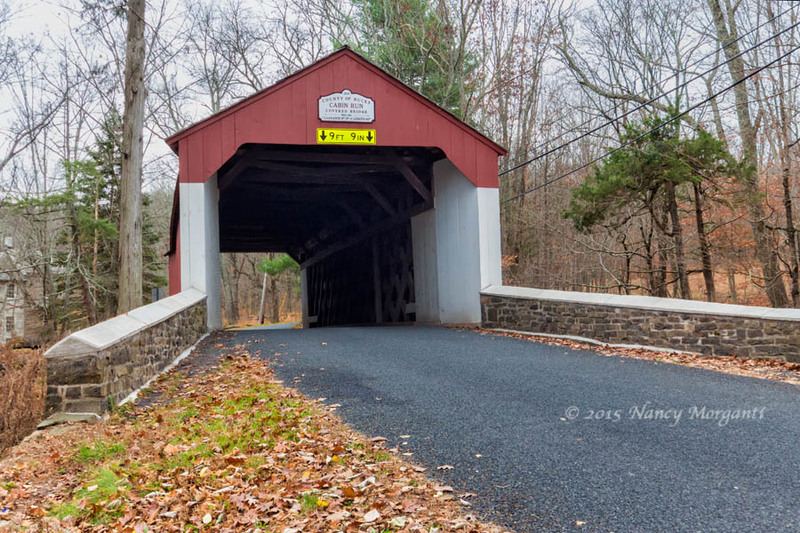 South Perkasie Covered Bridge: Built in 1832 of pine and oak, South Perkasie Covered Bridge once crossed the Pleasant Spring Creek. The heavily used bridge was condemned to traffic but was saved from demolition in August of 1959. The bridge was then moved to Lenape Park 0.8 miles away and is no longer open to vehicular traffic. The relocation received national media coverage. Width: 15 ft.; Length: 93 ft. A sign over the entrance portal warns of a fine for driving too fast or smoking "segars"! 12. Schofield Ford Covered Bridge: Originally built in 1873, this bridge was destroyed by fire in 1991. With the help of local citizens, the bridge was rebuilt in 1997 to the specifications of the original, with the exception of a small diamond-shaped windows being added to each side of the bridge. 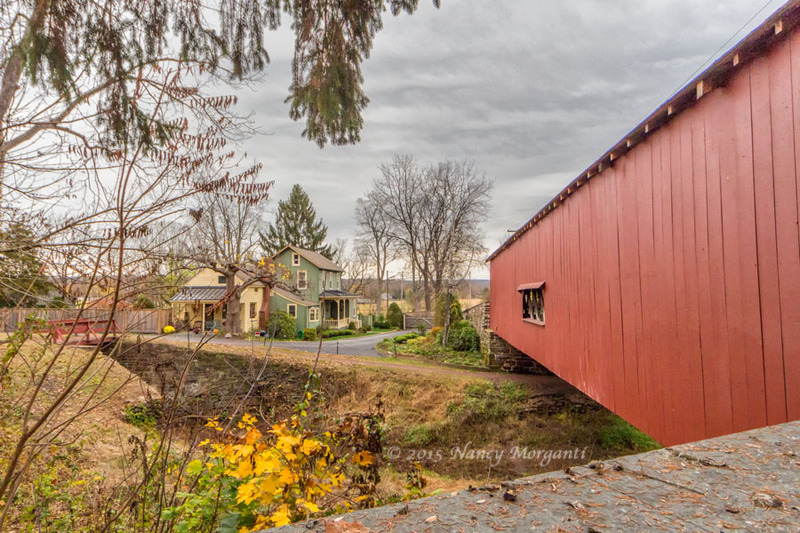 Constructed with native hemlock and oak, this town truss bridge is the longest in Bucks County. 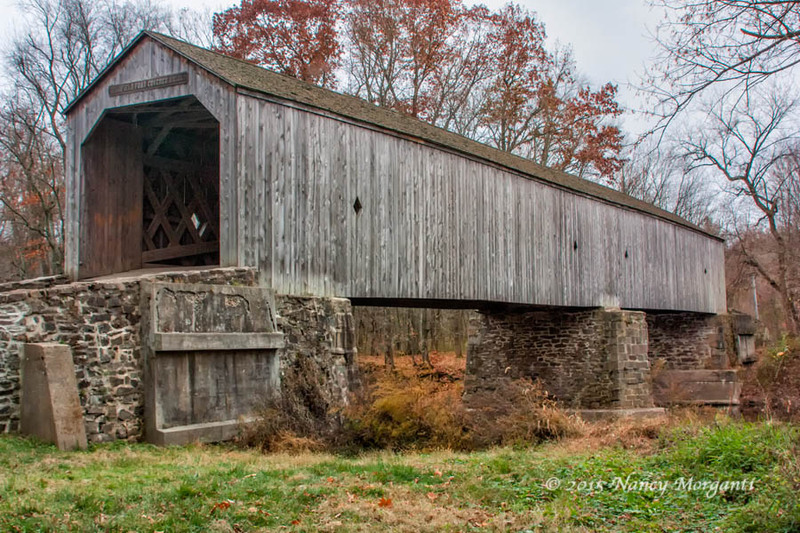 The grey patina of the unpainted weathered wood is also unique for a Bucks County Covered Bridge. It crosses the Neshaminy Creek. Height Limit: 13 ft.; Width: 16 ft.; Length: 170 ft. Accessible by foot, bike, horseback only.